Individual sensory neurons in the brain can be surprisingly predictive of animals' choices in simple perceptual decision-making tasks. This fact has been demonstrated in numerous tasks and brain areas. It is remarkable that a single neuron can influence the behavior, given the facts many thousands of sensory neurons are activated by a typical sensory stimuli. If the responses of all thousands neurons contribute independently to a decision, the influence of one neuron on behavior choice should be negligible. Perhaps very few neurons are involved in the decision, but then how could experiments so frequently encounter these extremely rare neurons that influence behavior? The vestibular system has unique advantages for exploring these puzzles, and we have exploited those advantages to gain important new insights how single sensory neurons can predict behavior. 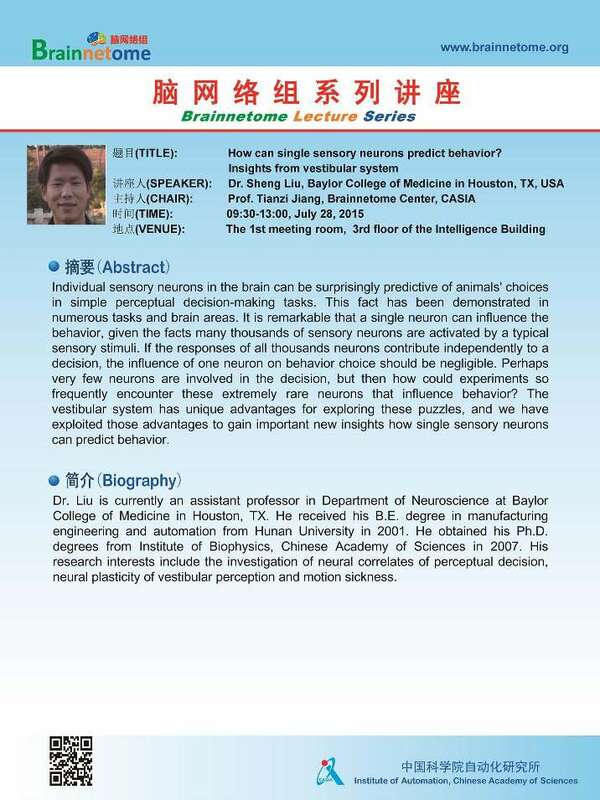 Dr. Liu is currently an assistant professor in Department of Neuroscience at Baylor College of Medicine in Houston, TX. He received his B.E. degree in manufacturing engineering and automation from Hunan University in 2001. He obtained his Ph.D. degrees from Institute of Biophysics, Chinese Academy of Sciences in 2007. His research interests include the investigation of neural correlates of perceptual decision, neural plasticity of vestibular perception and motion sickness.